Those are the words that my co-worker described when talking about how she wanted the nursery for her little boy to look. When I asked her what she liked she said: "brown & blue, stripes, damask, and dark furniture- more classic than modern. I want it less baby looking and more baby, toddler, little boy- something he can grow into." pharmacy lamp, chair, ABC LOVE print Made by Girl, drapes, lamps, striped baskets, rug, gold pouf, crib, bear, dresser and bookcase are both craigslist finds. I think this is a space that both Mom and Baby would be happy with for the long run. Let's hope she likes it! love it. Remi has a bla bla lion:) It's really his mamas because she thought it was cute decor. have a baby!! kick the husband out of that office, make it a nursery! Love it - especially the curtains and the rug!! Great job! 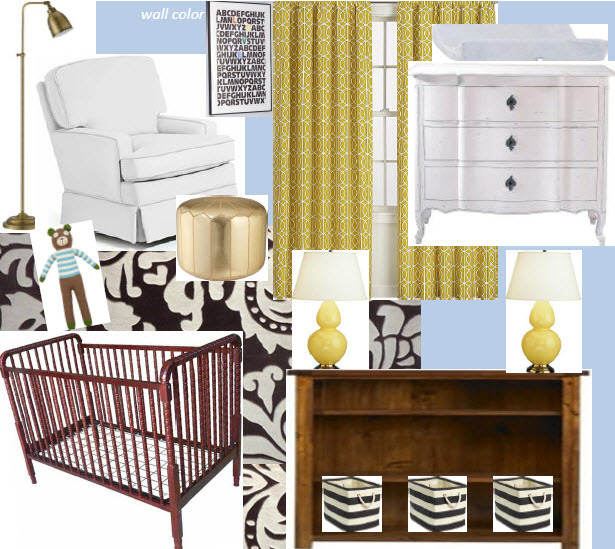 i love when baby rooms aren't covered in themes. this is adorable and I love the baskets! We definitely like the classic look much better. I love it! I agree that classic baby rooms are much better; I can't stand rooms that are overly baby-fied! Looking back, a nursery is a special time but so short lived. I love grown up looking baby rooms. All the cutsie cannot out live good classic lines. Love your design. Babies love mobiles and music....so you may want to add that....for what it is worth! Oh yes. What a great mood board. I certainly can't wait to see the final product. I think a lot of folks are starting to go this route. I love it! Those golden yellow curtains are just divine. Is that Dwell fabric? Love the lamps with the drapes...great job. Gorgeous design! What a great color combo. I'm sure your friend will love it.